Where you there in any of these nights? Rocked with Acrobat playing with the band? Did you sing your heart out when Stephanie started to play? Did you screamed - there in the arena or in your home - when the stars shined on the night? View from the South Side, B stage was great. Will post photos hopefully later today, but I do actually have to show up for work at some point today! Can't believe it's over. But at least now I can order a new credit card before tickets go on sale for Leg 2. My chip stopped working exactly three days after I bought our GA's and I have been carrying around the messed up card for months! All I want is you!!! Stephanie was fantastic. When she started strumming Angel it was perfect! Then All I Want Is You. I lost it! I've only been to 7 live shows and that was a first for me. So fun to scream out "All I Want Is YOUOOOOOOOO!!!!" Jessica the Belly Dancer made Mysterious Ways so fun. I missed seeing her on night 2. Shine LIke Stars was such a treat. I was 15 rows back in 104 and after Bono said goodnight I thought that was it until he started his walk back and pointed into the crowd on the north side. That person started jumping with their sign and I thought it just might happen. Still can't hear properly yet, but totally, absolutely, 100% worth it. PS: How do you show twitter or instagram in posts here? Unforgettable two nights! Loved hearing Out Of Control, Bad, Desire, Angel Of Harlem and All I Want Is You for the first time. Acrobat and Stephanie were both phenomenal. Great crowds too and WOWY last night was definitely special. Was fortunate to get a setlist and a confetti passage. Thanks U2 for two awesome shows! Is there going to be a leg 2? Was at night 2 and had GAs. I have seen them on every tour since Elevation and I'd say this show I'd rank at number 2 for me. Vertigo night 1 at ACC is still my top show, and was at the tip of the elipse for that one. The guys still have their energy and put on a very great show. A lot better than I thought it would be. Shows are long but good, though if you take away the intermission, and Bono talking it probably takes away maybe 10-15 of running time. Managed to chat to Stephanie a day after the show and just sending high praises which she was very thankful for, what a great job on Angel of Harlem which I finally got to hear. All I want is you haven't heard that since I saw the Elevation tour. Shine Like Stars something just gave me the feeling like he was going to do it. I wasn't even aware of the signs, I could just feel as he was posing he was going to sing words instead of the usual ooooo ooooohhh again. That will go down as a great moment too. Tons of room on the floor, very well organized I must say. Wanted to share a cool U2 experience for my son and I . We were lucky to have red zone north passes and got there early enough to grab a piece of the front rail. His second U2 show. 11 years old. We had plenty of time before the show and the security guys next to us were social, chatty and fun. We shared some peanuts with them, listened to their stories and time passed along nicely. During the show, one of the security guards came over to my son and handed him something. He whispered in his ear, " this is one of The Edge;s guitar picks ". Unreal. Ty was thrilled and I was equally pumped. The fans around us who we chatted with leading up to the show heard enough to be curious and wanted to share in the moment. Ty let it out of his hands - risky but very cool- and it made its way around with about 15 people or so getting to touch it, take pictures of it, some with Ty in the pic. Incredibly generous moment. But his amazing luck did not end there. During the encore, another security guard who we got to know a little came back to our area and conferred with the one who gave Ty the pick. They then walked over to him and gave him a copy of the stage set list for the night, Toronto 2. What a cool experience and an amazing show. Thanks to the guards and the fans around us who made Ty's experience pretty special. Steph....you made us cry....that was incredible ! I don't think I can adequately describe my two days at the Toronto shows. I'm still trying to process everything that happened. All I know at this point is that the stars were perfectly aligned and I dreamed out loud like never before. The shows were absolutely brilliant. I went to both and loved them. I've come to expect excellence from this band, and i got it, but I have to say this time around Bono's voice was really incredible. Highlight for me was BAD, which is one of very favourite U2 songs that I had never heard at a live show before. I also really liked the opening 'Joey Ramone' song, which on the album I thought was so so, and the Bono came onstage was wonderful..
Also loved the girl Stephanie, she looked so authentic. Was a little disappointed as I thought when these shows were advertised it was going to be two radically different set lists. I'm trying to find the name of the song that was played as we left the building, and secondly a video where Bono addressed Dave Grohl on Beautiful Day. Toronto1 we were at the main stage and Toronto2 we were on the rail at the B stage. It feels like a completely different concert from each vantage point. The main stage is classic rock band U2 and the B stage is more of the intimate and emotional U2. I loved both experiences. We had our two teenage sons with us both nights. The older one is a rabid U2 fan and this was the first U2 concert experience for our younger son. They were both blown away! They couldn't believe how close the band is to the audience and how amazing the sound and screen are. They held up signs each night and Bono especially liked their "Young Not Dumb" signs during both shows and when he cruised up to the GA line and rolled his window down he mentioned to our son that he noticed the signs. Pretty cool! Toronto1 - Bad had me in tears, which I was not expecting. Brilliant performance and definitely a highlight for me. Toronto2 - All I Want is You pared down was perfect. They were supposed to do Crystal Ballroom after Angel of Harlem and before Every Breaking Wave at the B stage and then move to the main stage for AIWIY later on but there were technical difficulties so we got AIWIY with the female audience member accompanying at the B stage. 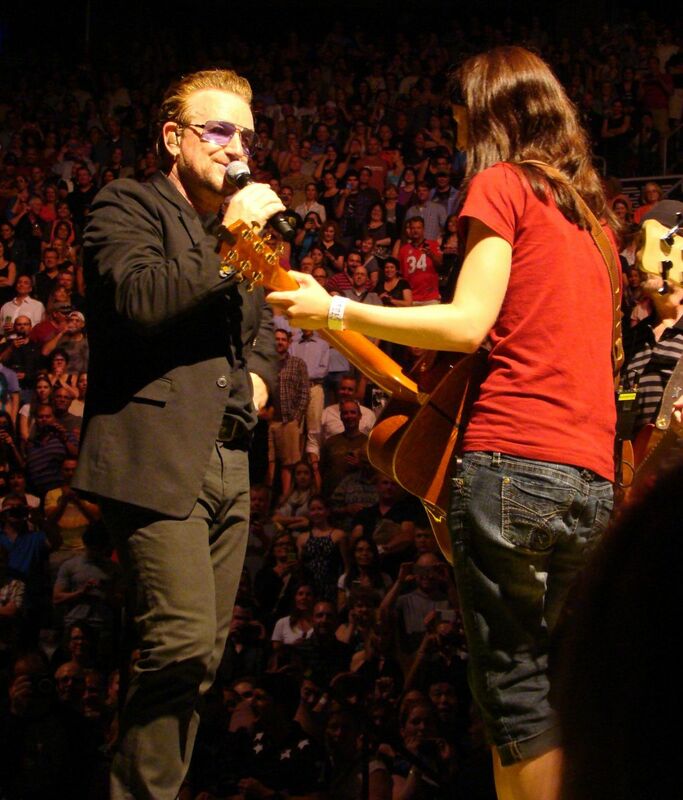 She had actually said she'd prefer to play AIWIY when Bono asked her to do Angel of Harlem. Cheeky . I wanted to hear Crystal Ballroom and was really hoping for it in Toronto but I can't say I would have preferred it at the B stage over AIWIY. Crystal Ballroom needs to be glitzed up when they play it again. Drop those disco balls on the catwalk and drop the disco beat as Bono dances from one stage to the other... I'd love to see it that way! Montreal3 - I was on stage for the U2 "party"
Each concert was a different experience and filled my cup to overflowing. Really amazing! You know I've been singing All I want , all day. Stephanie is so great, her style sounds like surfer bluesy. Just that added element,so inspiring to me. I'm still not sure I can put into words my few days in Toronto, but I wanted to get it out the best I can before Boston kicks in. I'm still wondering if at any moment I'm going to wake up from a crazy dream and find that that's all it was. I'm pretty sure it wasn't. I think it is safe to say that I was dreaming out loud. When I finished my last show on the 360 Tour I never thought that U2 could blow me away like that again, but thankfully I was wrong. Toronto 1 was the night my dreams came true. The stars must have been perfectly aligned for myself and my friend Kim. Whenever we go to shows together and have GA, we always wear our Larry Mullen Band shirts, just wanting to show our love and support to the founder. When I headed to Toronto from the States, I knew that I had upper level 300 seats, but we were going to try our best to get GA tickets for myself and my friend, Tracy, that was traveling with me, so I brought the shirt, just in case. We missed the first ticket drop on Saturday afternoon because we had just arrived. Sunday morning we heard that the GA line was started, so we headed down and got numbers. Yes, I got a number, but still did not have GA tickets. Late Sunday afternoon, we got word that there was someone that had extra GA tickets at face value. So we were able to get those and sell our seat tickets to someone. Monday morning came and we were all hanging out in the GA line like you do and I was sitting there thinking about how I could make a sign, asking Larry if I could have a drumstick. Worst thing that could happen would be that he wouldn't. So I sat there, coloring my sign and passing the time. Once the doors opened, we got in (I was number 28 on the northside) and secured our spot on the rail of the e-stage. They got down there to perform and I held up my sign and he smiled and then things got pretty crazy on the stage. That's when the tribute band Acrobat performed. Kim saw Larry give their drummer some sticks, so we thought, "well that's it. He gave some to him." Then the band went into "Stuck In A Moment" and from where we were, all I could really see was Edge's bum and the piano. We couldn't see Larry at all. And then the song ended and all the sudden, he popped around the piano and was standing right there, handing the sticks down to me and Kim. He made sure that none of the grabbing hands around us got them and didn't let go until he knew that I had one and Kim had one. My U2 world exploded into fireworks at that moment. That was my dream come true. One of his drum techs came by a bit later and told us that we didn't know how special that was, that he rarely does that. Actually we did know that and we were very thankful for it. Some people have the dream of getting onstage, and while that would be nice, I know I'd make a fool out of myself. My dream for so many years was to have a pair of his drumsticks and to have him personally hand one to me was absolutely amazing for me. Of course it didn't hurt that I thought that show was probably the best city opener on the tour so far. Toronto 2, we had 300 level seats and that was fine because I wanted to be able to see the full production (note here that if you are only going to one show and have GA, I would not go for the rail. You will miss so much.) So we figured since we had seats, we would hope for a meet and greet since they weren't able to stop the day before apparently. It started pouring down rain, but we had ponchos and we had patience and Bono stopped by while there was a break in the rain. 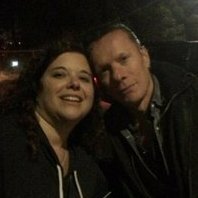 I was quite happy about this because I had always wanted a do-over from when I saw him in Raleigh in 2009 and I was so star-struck that I couldn't even speak. This time, was I not only able to speak but Kim and I asked him to tell Larry "thank you" for us. Bono told us that he remembered that and he would tell him thank you for us. He also said that Larry didn't come out in the weather because he didn't want to get his coif messed up. We all laughed. The show was amazing and I loved watching it unfold on the screens, but I did miss being closer, especially when we got the "shine like stars" lyric in With or Without You, but I was there and that's what matters. Both nights were wonderful. The whole band is on fire this tour and I love it. I took some pictures and I have them here: https://flic.kr/s/aHskfgrktv I didn't take a lot of pictures because I wanted to absorb it all. I hope everyone else who was there had a wonderful time too. Did they really do the Shine Like Stars?!?! They really did. There were a lot of us that had signs requesting it on the first night and they did it the second. The lyrics were slightly off, but that's ok.